Photo: Charlotte Ørnemark. 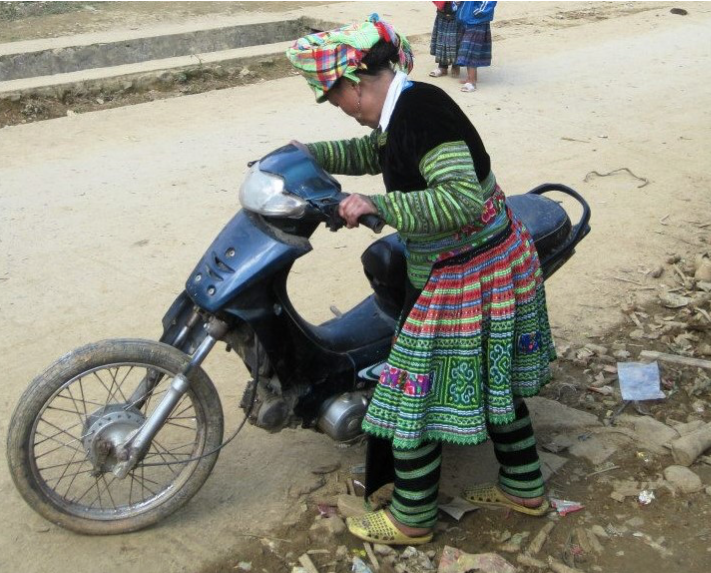 Women on the move in the traditional Hmong community, Northern Vietnam. “OGP countries have produced 2,731 commitments – does it shock you that only 9 related to women or gender?” Sadly, it didn’t. But kudos to the Open Government Partnership (OGP) for being up front about it in their March newsletter. Of course open governance is also about gender. It is about power and structural power patterns (again, read gender). And it is about how power patterns and gender biases affect the data that filters through change processes. It is easy to assume that feedback and open data – which in itself is neutral – should steer clear of normative interpretations around gender. Should openness not maximize the availability of data for all citizens? Yet, the ability for ‘all things open’ to remain (or become?) a movement for everyone relies on us addressing the inherent power structures at play. Open data must benefit women as well as men. Civic spaces are gendered (yes, all of them): It’s easy to refer to the ‘community’ or ‘citizens’ as a homogenous unit. But even the notion of ‘citizen’ is a gender-loaded term, particularly in contexts where citizens’ rights – to obtain an ID card to to vote or to make basic health decisions about their own body – are inherently gendered. Feedback and citizen-generated data affect the perception of what is ‘normal’ in different settings, feeding into how local communities and civil society are gendered spaces. The number of women present at public hearings or community meetings insufficiently indicates women’s participation in locally generated data streams. In the TechMousso (TechWoman) initiative in Côte d’Ivoire, women were invited to every local meeting, but the right to speak was reserved for the men. This called for alternative ways to generate feedback from the women. Parallel processes to strengthen women’s collective organizing outside of formal feedback spaces can help to counteract such power asymmetries. Data by women about women and for women is needed: Mainstream data sets are becoming increasingly gender disaggregated. There are also localized data experiments that directly involve women as a way to enrich and interpret data about women’s experiences in different settings. But the two rarely meet. In fact, many gender data initiatives talk about gender equality and women’s rights without pro-actively filling data gaps in a way that is actionable or that feeds into mainstream data. Innovative efforts to capture data ‘about’ women include the Women’s Empowerment in Agriculture Index. The ‘by’ and ‘for’ may be harder to crack, but there are good examples. For instance, in an effort to build inclusive value chains in rural Vietnam, women were provided better access to information and services by hiring female distributors of rice fertilizer and training female veterinarians. The initiative also taught female farmers how to track and monitor their own production data to move up the value chain. Another example illustrates the need for gender-sensitive feedback channels. In a Sida-funded Kenya rural roads program women were brought into the unskilled labour force with the goal of economic empowerment. But, it added to the women’s burden and made men less responsible for household expenditures. The quota of having 30% rather than 50% women in the work force also reinforced a message of inequality. Feedback to the local road engineers was not sufficient – they were only responsible for implementing the labour quota. To close the loop, a gender sensitive feedback channel was needed for women to freely raise their concerns, directed at the right decision makers. Ability to access data is not the same as empowerment to act on that data: Gender differences in accessing data and providing feedback are increasingly well known. Apart from the more obvious digital divide, the World Wide Web foundation found that women in poor urban areas across Africa, Asia and Latin America were 50% less likely to be online than men, and even when they were present were 30-50% less likely to speak out. Gender disaggregated data is one step, but more importantly, women need to be empowered as part of the data analysis. This inclusion will help detect systemic and gendered inequalities and will shift the focus away from women as the ‘channels’ or ‘recipients’ of data when their level of influence is limited. Photo: Charlotte Ørnemark. Mobility Maps. Nepal. 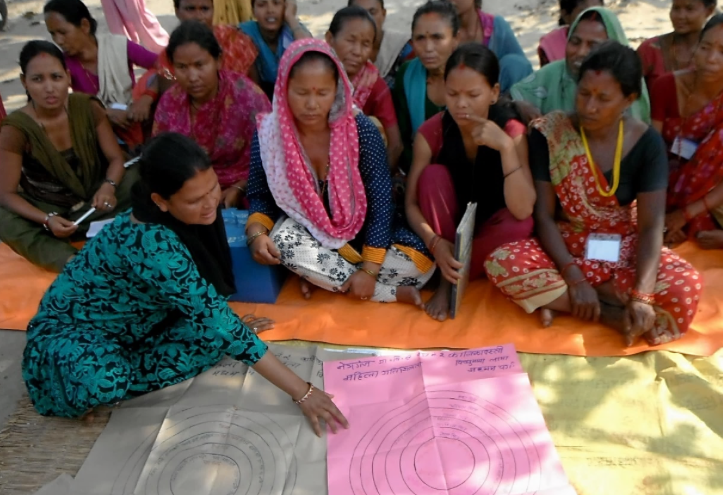 A three-year livelihoods project in rural Nepal asked local women’s groups to draw ‘mobility maps’ and monitor them over time to visualize how far from home they could go on their own, without a man to accompany them. The approach was innovative and visually compelling. It showed that only one woman in the group occasionally made it into the closest city. Gradually, she made it there more frequently. She was also the undisputed leader of the group, in charge of the local group’s collective savings. The exercise gave a whole new data set on local power patterns and dynamics. At the end of the project, however, it was unclear how this data could be used by the majority of group members, and how it could link into local planning or problem-solving. It contributed to increased self-awareness – with the women expressing their knowledge of how far they could travel – but several group members also saw more obstacles, not fewer, that they needed to overcome. Additionally, the leader in the group grew her power base, but for the other women the data made no (or very limited) difference. They accepted she was the only one who could widen her mobility. For relevant data to trigger change (via feedback and socialization, knowledge and adaptation), it must be demanded, owned and actionable by the users from the outset. It also needs to be closely connected to a broader set of actors involved in local problem solving and connect to other data streams so that it can challenge the status quo. Looking back at those mobility maps, it needs to help us widen that circle in which we are free to act – both individually and collectively – using data to gradually push the boundaries of power. 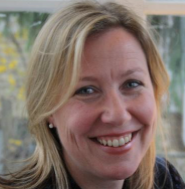 Charlotte Ørnemark works as a consultant on issues related to data democratization and how evidence-based learning and adaptation can be used as a force for social change. She specializes in the areas of gender and human rights as well as transparency and accountability in democratic governance. She has worked as a consultant for several bilateral and multilateral development agencies such as Sida, the World Bank, UNDP and UN Women as well as for various non-governmental groups. In addition to having worked and lived in Africa, with shorter assignment in Asia, Eastern Europe and the Arab States, she worked on socializing evidence for local public health planning with indigenous communities in Arctic Canada.